Students and their parents and friends were there with a good smattering of JazzErie members and friends. 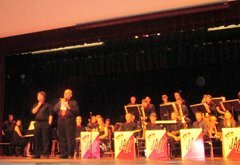 Student jazz bands from Harbor Creek, General McLane (two bands) and McDowell were there, along with members of the Misery Bay Big Band and special guest guitarist Frank Singer. JazzErie Scholarship recipient WESLEY WOODWARD, a trumpet player from McDowell H.S., was there with his family. He will attend Slippery Rock University of PA in the fall. Woodward, who plays in the Erie Junior Phil as well as school bands, says that he was inspired when he attended a Next Generation concert a couple of years ago and heard trumpeter Stephen Hawk to get serious about playing jazz on his instrument, a skill he has been pursuing ever since. This year's Next Generation concert featured a number of inspired performances, marching in the isles, and the following gem: student Leah Mathie singing with poise, good time, and emotion, with the Misery Bay Big Band's juicy arrangement of "Over the Rainbow." Great show, great enthusiasm -- all the things we have come to expect from this remarkable event. This was John Mrszalek's final year of organizing this event. His successor at Gen. McLane has promised to continue the tradition. John's retirement celebration came a few days later, on June 7 at McLane Church in Edinboro, PA. There was music from the Gen. McLane student band, from McLane alumni (who are already making plans to get together again, and members of the Misery Bay band. A righteous celebration of the contributions of the music educator who has done so much for Erie and area music. 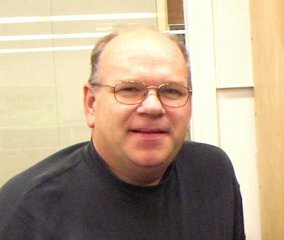 For a more complete article on John, his career and his contributions to the area, written by John Huegel, a McLane Student Jazz Band alum, go to the JazzErie website at www.jazzerie.com, click on About JazzErie in the tabs on the right side of the Home Page, then scroll down to What's New, and John Marszalek Tribute.